I’ve always loved the strength, optimism and fighting spirit of this song and years ago when I first heard it, it summed up for me the spirit of the Scottish people who were displaced during the Highland Clearances and how they fought through atrocious and inhumane conditions to sail to the new world of Canada especially and from there forge a new life for themselves and their descendants. ‘Stay alive’ is the song’s simple message, for that is what we must all do. It’s sad to think about what happened to Stuart Adamson but he has left us with a fine legacy. Quite often these days I like to listen to a little music when running alone. I succumbed from this practice for a lot of years, mainly because I like to appreciate some of the attractive environments I chose to run in. After all, what could be more pleasant and uplifting than listening to Spring birdsong when gliding through a dappled glen, or listening to mighty waves beating against a sea wall on a beach. Sometimes though it’s good to have the company of a little music, especially when the running might be trying for whatever reason. I see many people that run along in time to personal stereos these days, we all know what a common sight that is on the streets and pavements. Apart from one or two very significant safety drawbacks it’s easy to see why people are still continuing the jogging boom of over thirty years ago with the encouragement of a beat or a melody to step out to. On a shorter run I tend to like up-tempo music, perhaps not surprisingly. There’s a tendency to seek out music with a personal meaning or history for me too. One such piece of music I fins particularly stirring is the title track from a little-known, low budget movie from years ago entitled Restless Natives. Big Country, Rescue Rooms, Nottingham. Friday, 17th August, 2007. It was a friend north of the border who gave me the heads-up about this impending gig in the heart of Nottingham’s Studentland. The gig and tour are being carried out as a twenty-fifth anniversary commemorating the band’s brilliant debut album. “The Crossing”. 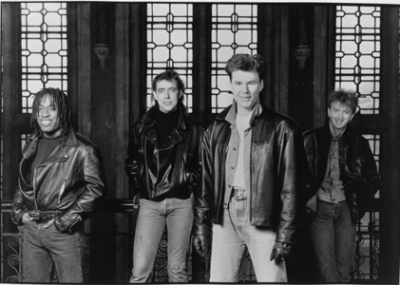 Sadly of course, the band’s singer, main songwriter and twin lead guitarist, Stuart Adamson is no longer with us after his desperate loss through his suicide in Hawaii in 2001. His influence on the band and it’s music is still evident though. So is the love and respect for him from his former friends in Big Country.